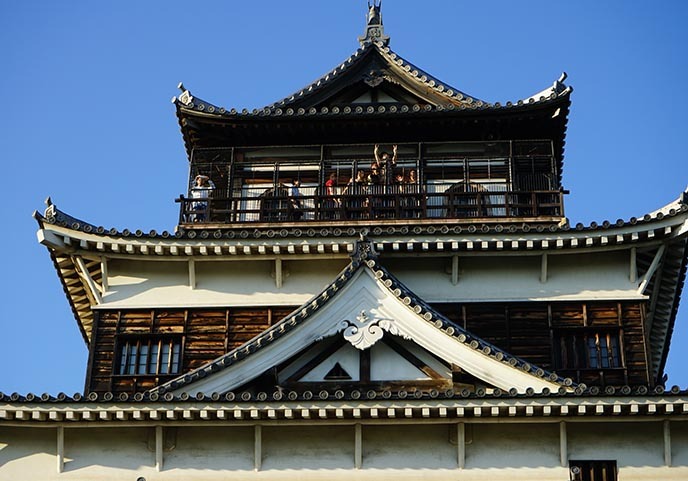 Travelling to Hiroshima: Castles & Culture! 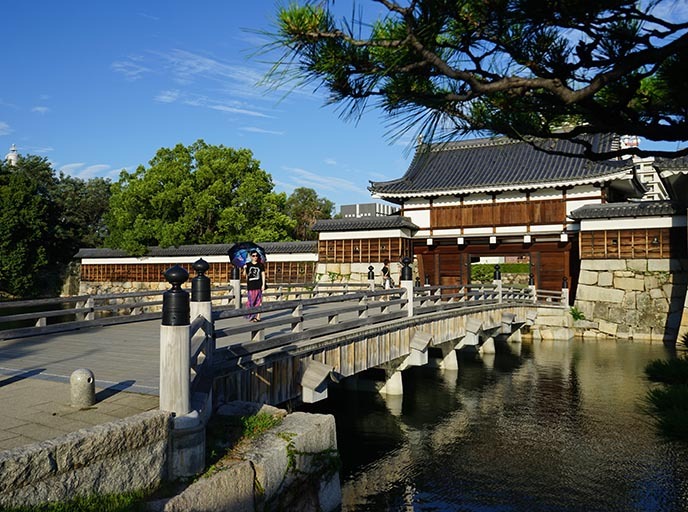 Japanican train & hotel package, Miyajima floating gate, Peace Museum. 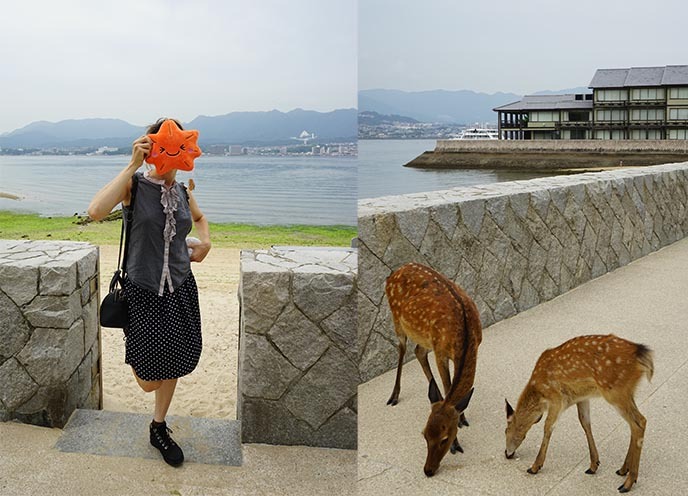 Leaping back from my blogging hiatus… with a story about our adventures in Hiroshima, Japan! As I mentioned in the last post, I took a blog break as I was insanely busy with a Tokyo TV shoot. I’m glad to report the show went well, and I then had a great time traveling in Asia with my friends. 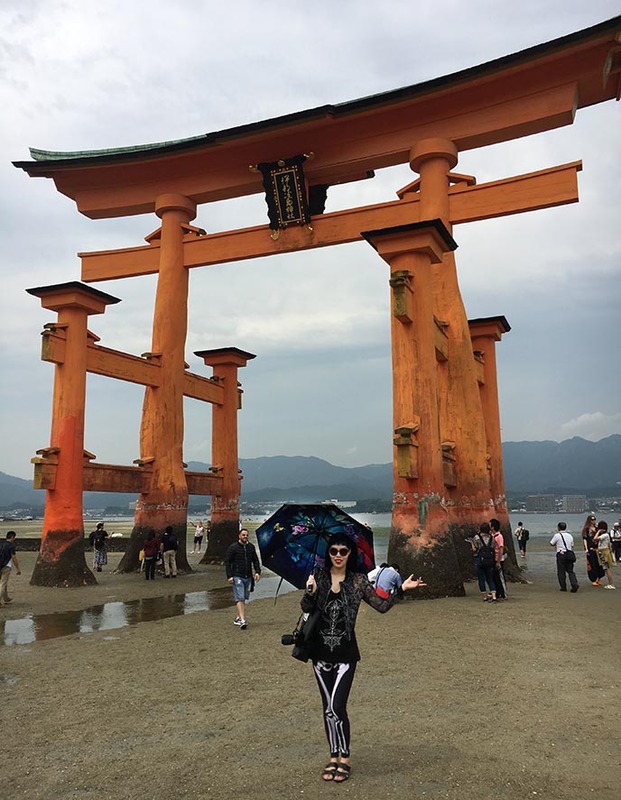 Now, I’m refreshed and ready to share new travel / fashion / culture stories with you… beginning with my JAPANiCAN trip to Hiroshima, a city I’ve always wanted to see! I carried this Boy 1904 umbrella everywhere with me during the summer. 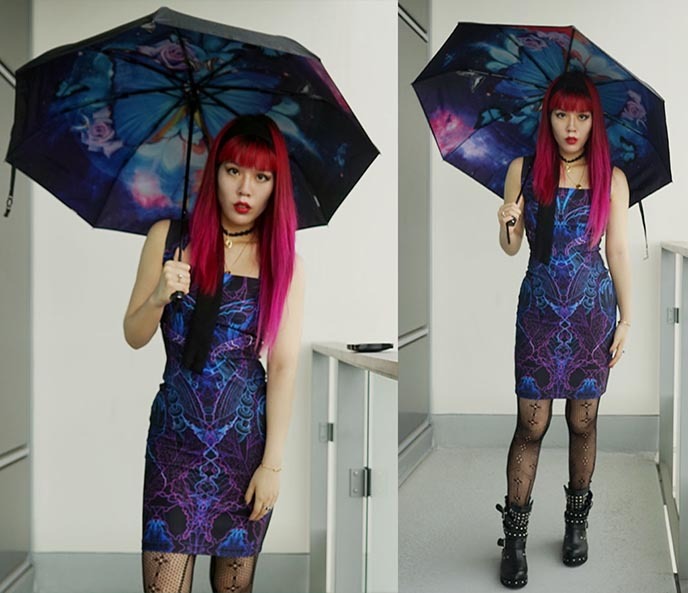 The UV-proof fabric keeps me cool and protected from the sun’s rays, and the roses / butterflies / space pattern drew tons of compliments. The parasol opens and closes smoothly, and has a well-designed strap to hold it together. Give Boy Umbrellas a glance; they have plenty of colors and original designs. 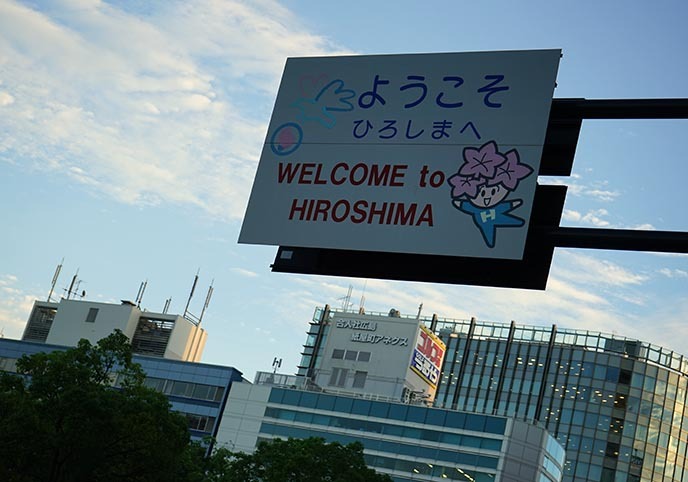 Now, let’s say hello to Hiroshima! 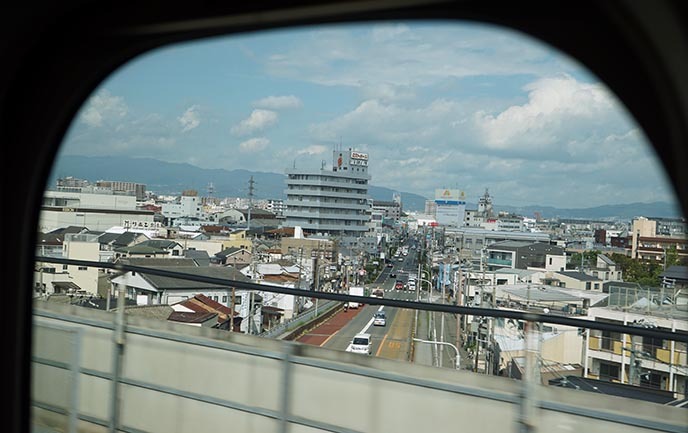 The major Japanese city is located south-west of Tokyo, about a four hour train ride or 1.5 hr flight from the capital. Because of the distance, my friends and I never got around to visiting Hiroshima until this time. If you’re keen on visiting Hiroshima for a few days, I strongly recommend booking a JAPANiCAN travel package like I did. 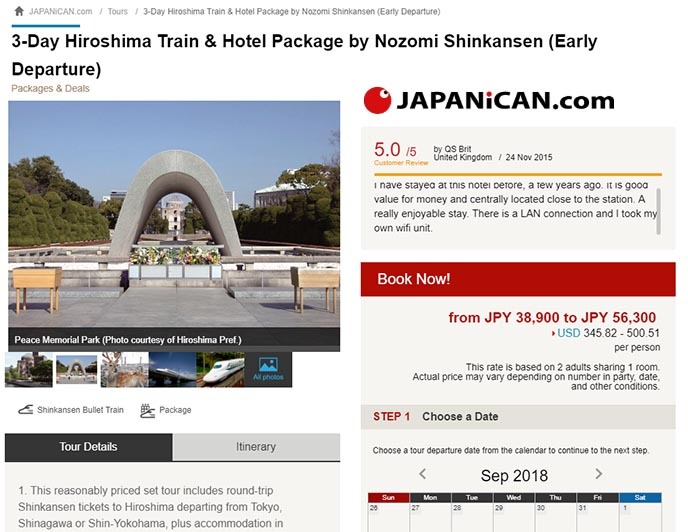 Their “4-Day Hiroshima Train & Hotel Package by Nozomi Shinkansen” was exactly what I was looking for: fast, round trip bullet train tickets from Tokyo (or Shinagawa or Shin-Yokohama), plus three nights hotel in Hiroshima. 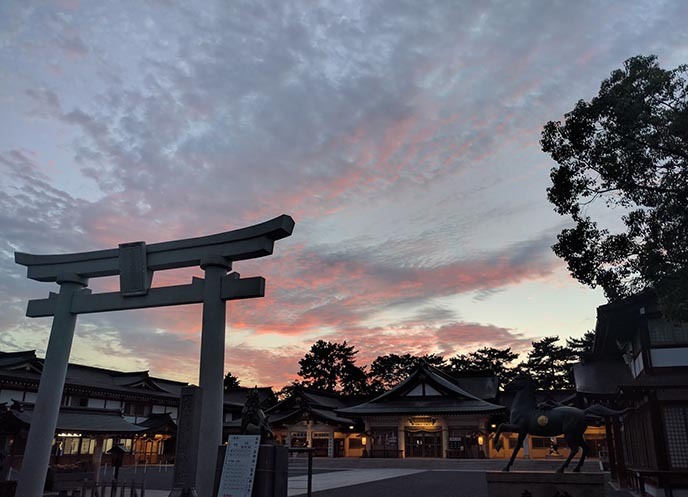 JAPANiCAN’s website has options for various travel packages and tours in different Japanese cities. Making a booking on their website was simple, and took the stress out of searching schedules and hotels. JAPANiCAN booked me into Hotel New Hiroden (which was in the perfect location by Hiroshima Station, and included a free 1-day streetcar pass). They reserved my train tickets, and delivered them to my Tokyo hotel a few days before the departure. Four hours later, I was in Hiroshima. And a four-minute walk later, I was checked in to my hotel, and ready to explore! JAPANiCAN’s four day travel package made trip-planning a breeze, and the total cost was far lower than if I booked regular tickets and hotel rooms on my own. 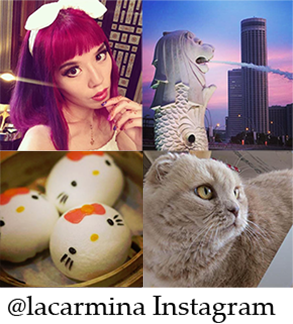 Check them out if you’re planning a trip, as they have fantastic travel options for all major cities in Japan. I loved the flexibility of the package: they arranged the hotel and trains, but I was free to spend my time exploring however I liked. 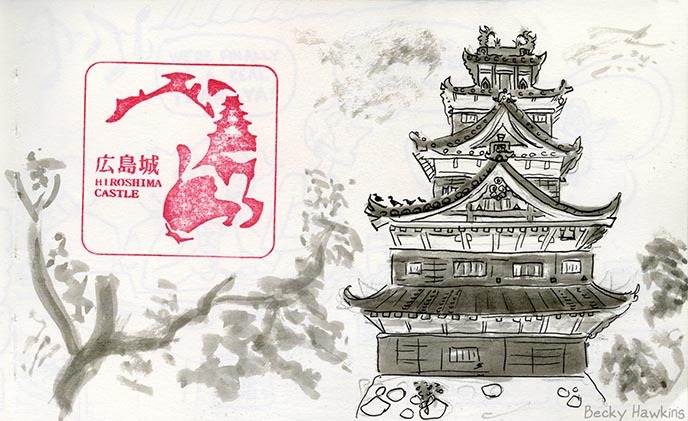 My friends and I began our journey at Hiroshima Castle, also known as Carp Castle. 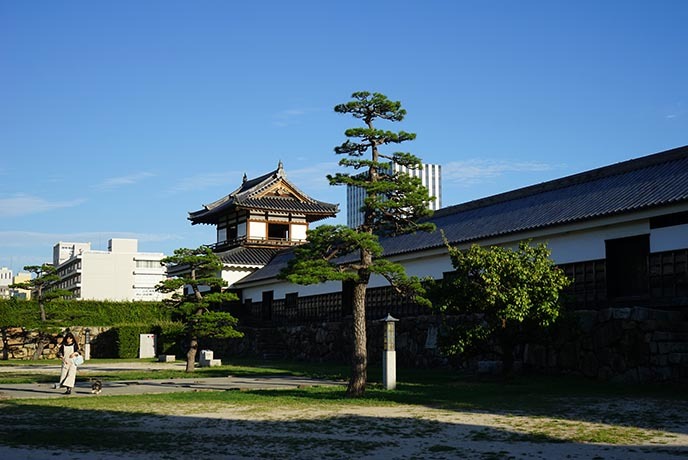 Built in the 1590s, this was the elegant home of the daimyo, or feudal lord. The castle was sadly destroyed by the atom bombing in World War II, but a close replica was rebuilt in 1958. We crossed the moat bridge and entered Hiroshima-Jo. The classic stone and wood architecture made me feel as if I were in a samurai movie. The castle’s main keep is five stories tall, and surrounded by beautiful gardens. I was traveling with two artist friends, and they created art all throughout the trip. 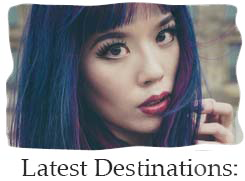 I’m excited to introduce this new “travel illustration” feature in my stories! I love how their works capture the feeling of being there at that moment. 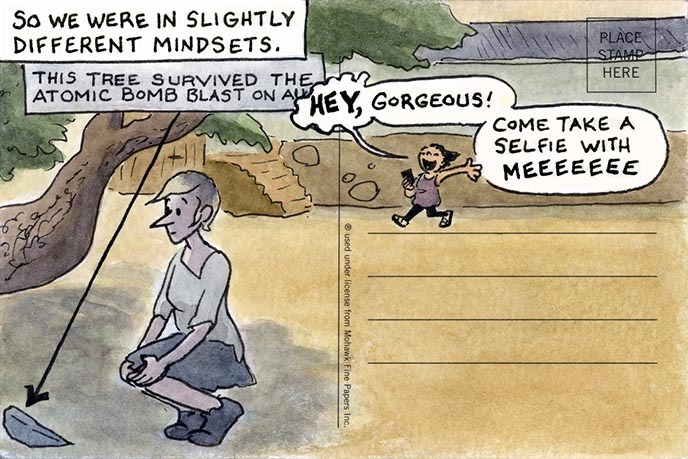 Becky Hawkins has a series of journal comics about travels and daily life. Many of these postcards showcase the humorous and memorable moments of traveling — such as this one, about her and Naomi! For a 300 yen fee, you can enter the castle. 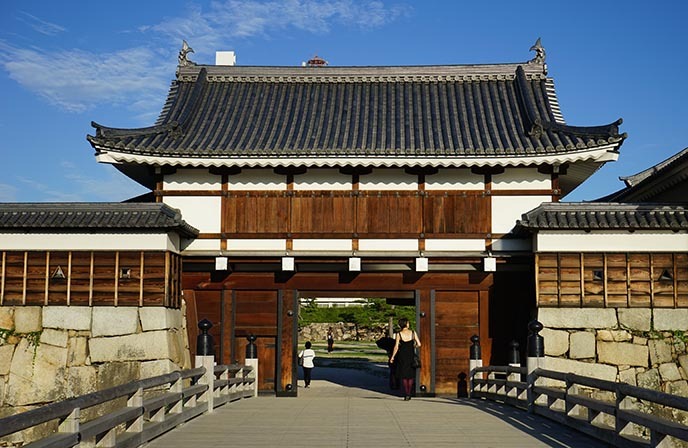 Inside, there is a museum that focuses on Hiroshima’s history before World War II, as well as Japanese castles. 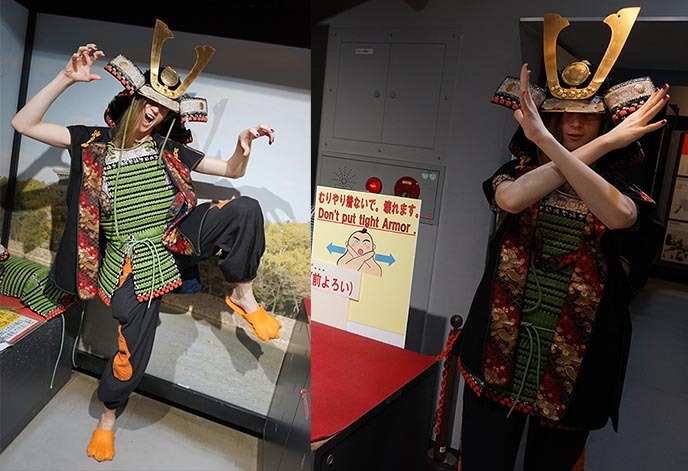 As Yukiro demonstrates with a “da-me” pose, you can try on the samurai costume… but “don’t put tight armor”! Visitors can climb the staircase to the very top floor of the castle. From the balcony, you can take in panoramic views of Hiroshima, particularly the rivers and popular Hondori district. Can you spot my friends waving at you? Hail Hiroshima! To get here, you have to take the train for about 45 minutes from downtown Hiroshima, followed by a short ferry ride. 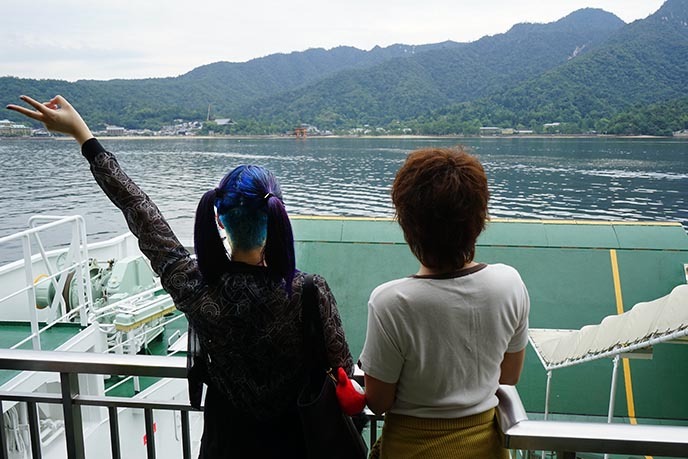 We rode the Sanyo line from JR Hiroshima Station to Miyajimaguchi, and then hopped on the JR Miyajima Ferry. If you go out on the balcony, you can wave at the red arch as the ferry approaches the isle. The Shinto torii gate is unique for being built over the water, giving the impression that it’s floating in the water during high tide. You can check the daily schedule to see when the sea will be at low and high tide. (We arrived in Miyajima around 10am, which was just when the shops were opening). Itsukushima is an adorable destination, with plenty of cafes and craft shops that maintain an Edo-era feeling. We stopped for excellent coffee and breakfast before wandering around. 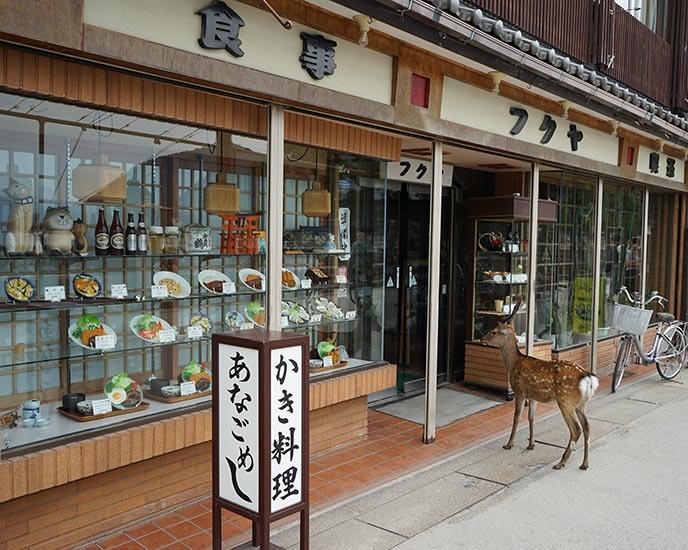 Without doubt, you’ll encounter the local deer as you walk around. Looks like this guy is hungry for Japanese curry! 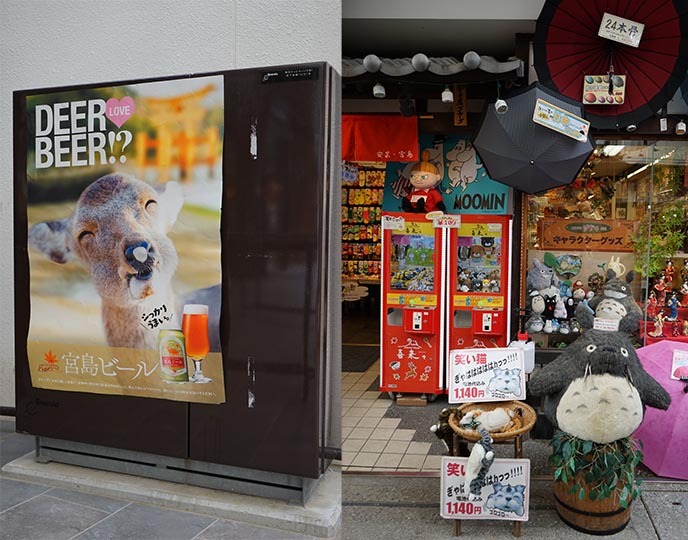 The stores sell local specialities, such as “deer beer.” Kawaii is everywhere in Japan, so you’ll find characters like Moomin and Totoro in the souvenir shops. More snaps of cute collectibles. 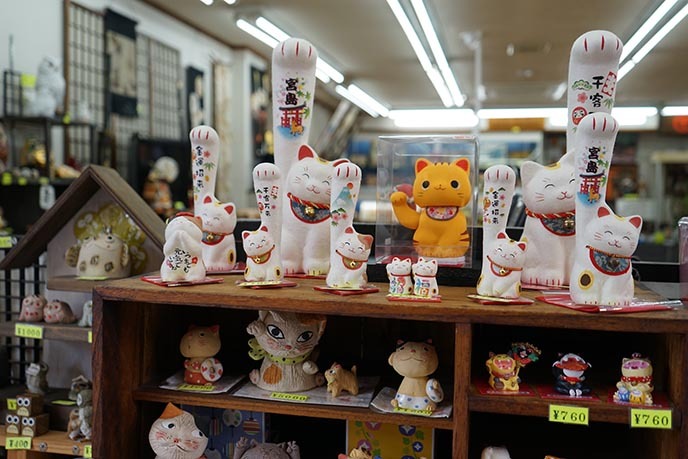 Those lucky cats (maneki neko) are truly reaching for the stars, with their giant paws. I made friends with a giant tanuki, or Japanese raccoon! 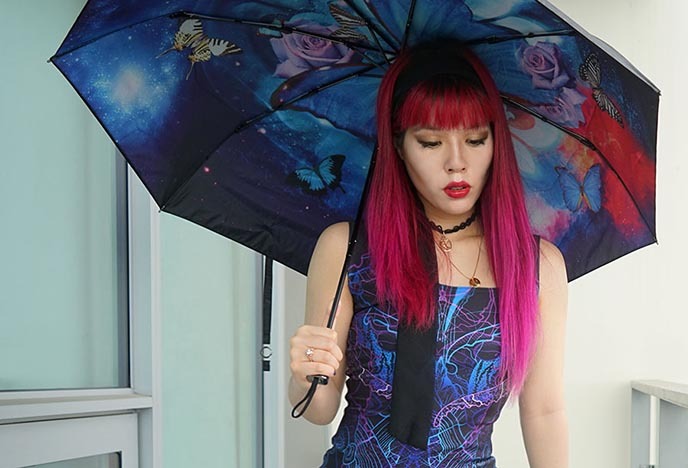 Outfit details: I’m holding a Boy 1904 umbrella, and wearing an alien tank top like this one. My skeleton bones leggings are similar to these ones here. 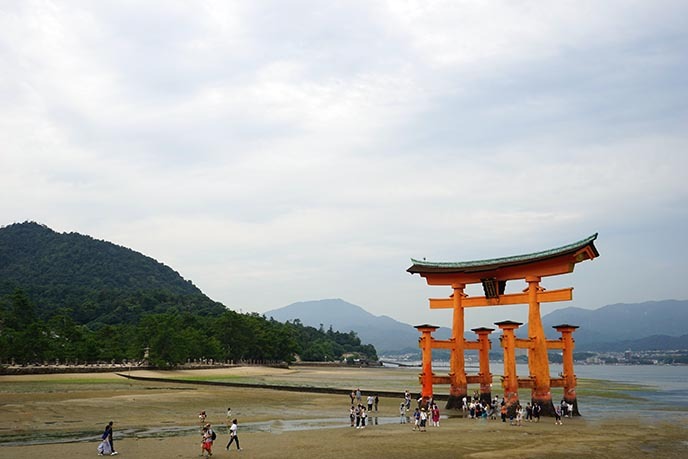 Miyajima is a destination for slowing down and enjoying the natural surroundings. 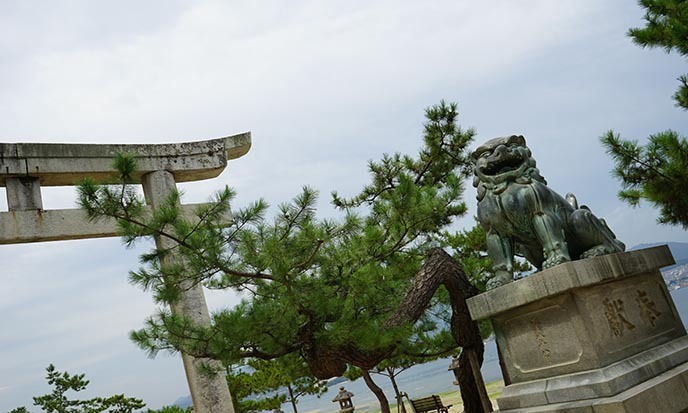 The seafront promenade is especially lovely, and passes by both Buddhist and Shinto temples. At low tide, the water drains out of the bay, and visitors can walk all the way up to the gate. 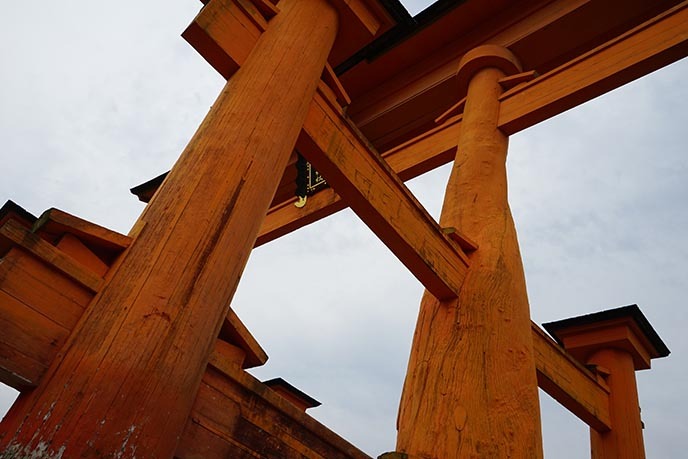 Miyajima torii’s vermilion color supposedly keeps evil spirits away (but somehow, this Goth sneaked through). The bottom of the gate, which is sometimes immersed in water, is covered in barnacles and coins left by visitors. Wearing skeleton leggings and an alien top. Itsukushima Shrine was built in 1168 by Taira no Kiyomori, the powerful military leader of the late Heian Period. 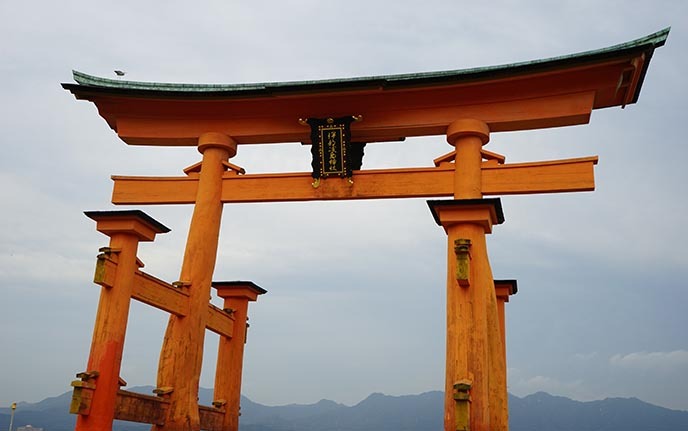 He selected the island to be the site of his clan’s family shrine, and mounted this otherworldly red-orange gate to protect it. The island has long been a spiritual location. 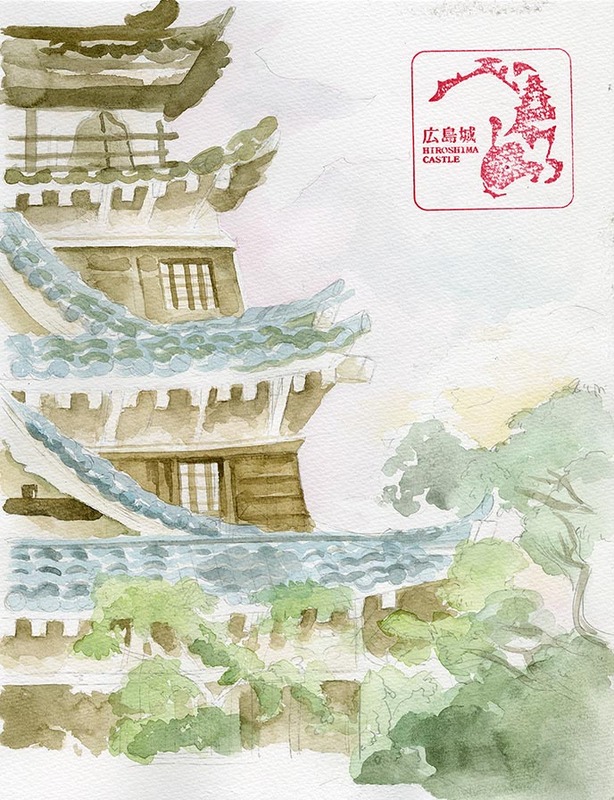 In 806 AD, the monk Kobo Dashi climbed the highest peak, Mount Misen, and made the mountain a center for Shingon Buddhism. (However, the primary location for Shingon is Koya-san, which I also visited). 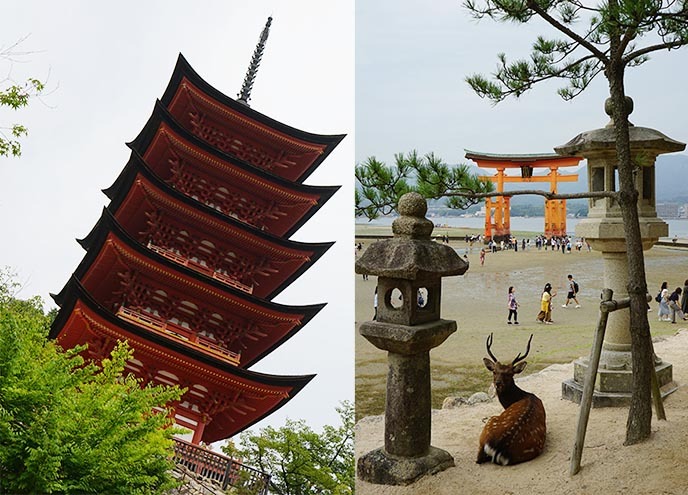 I took snaps of the traditional Gojunoto Pagoda, and a deer with impressive antlers. 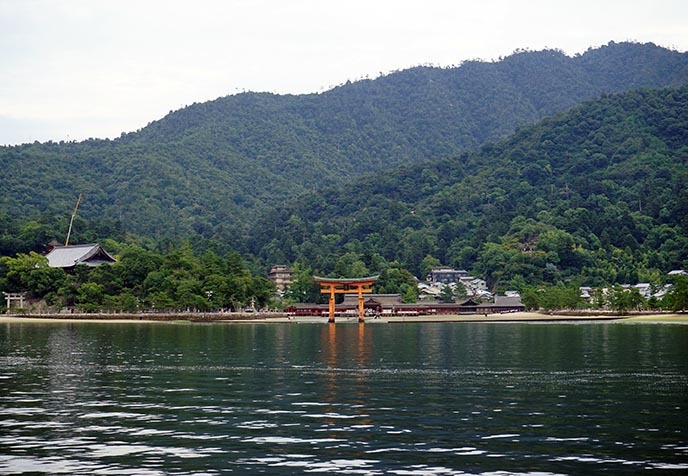 What else is there to see on Miyajima? 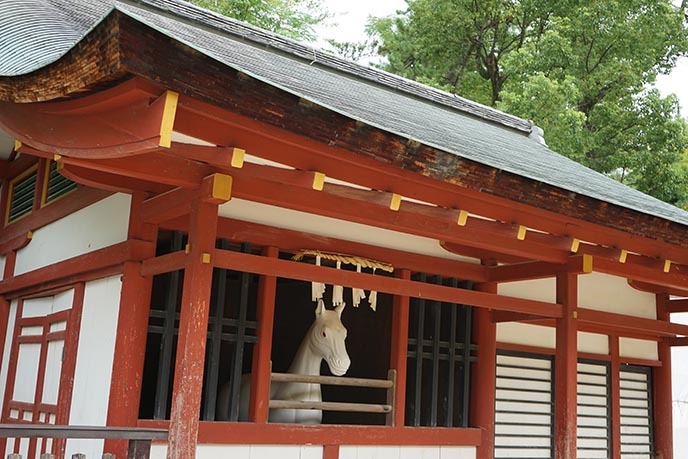 More shrines, a white horse statue in a stable, and the world’s largest rice scoop! 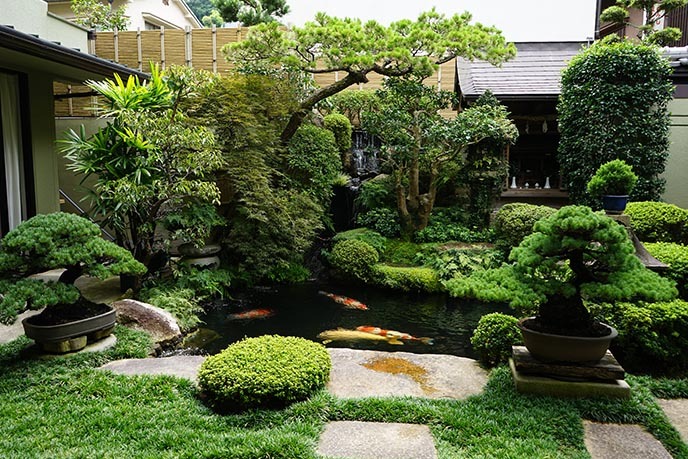 In the back of one of the stores, we discovered a beautiful Japanese garden with bonsai trees and giant koi fish in the pond. 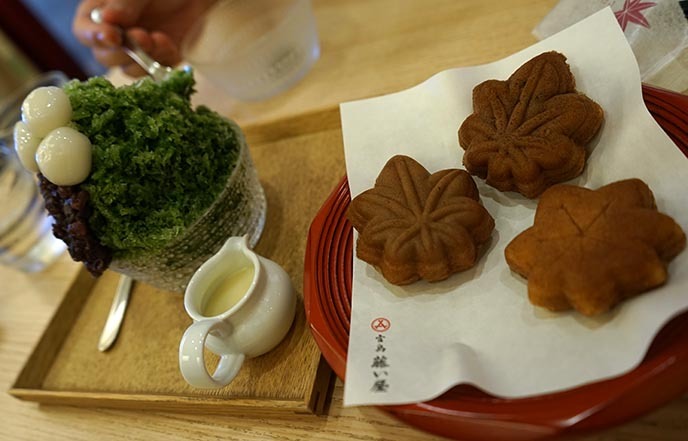 Don’t leave Itsukushima without trying momiji manju, a buckwheat and rice pastry shaped like a maple leaf. These mini cakes are usually filled with red bean paste, and are a specialty on the island. This sweet was invented by a wagashi (confections) maker in the late Meiji period. 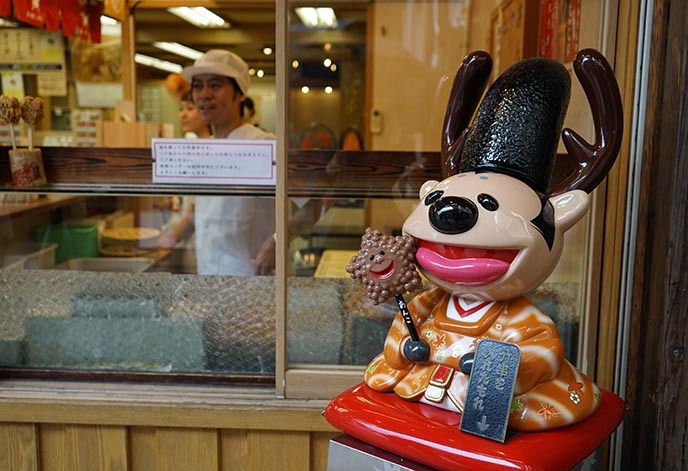 Miyajima’s various shops serve momiji in different ways, including steamed or fried, and stuffed with different fillings like chocolate, cream and cheese. I recommend trying something warm and freshly-made; you can’t go wrong with the original red bean ones. Naomi got an adorable stuffed momiji, to commemorate our trip. Miyajima is a must-see when you’re in Hiroshima, especially for those who love Japanese culture, architecture and spirituality. We dedicated an afternoon to remembering the nuclear bombing of Hiroshima during World War II. 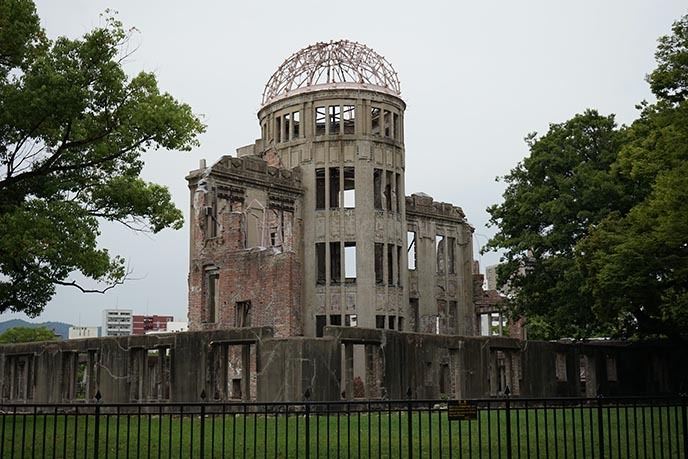 The sheer devastation of the attack hits home when you see the Atomic Dome, or Genbaku Dome building (above). Only the skeleton of the structure remains, and the surrounding walls are blackened. Nearby, we stopped at a plaque that marks the Hypocenter, or exact location where the atomic bomb “Little Boy” detonated in mid-air. 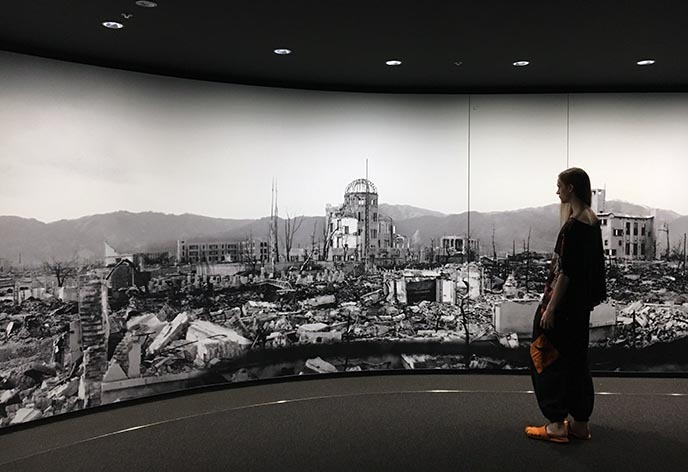 Everyone who visits Hiroshima should do their best to visit the Peace Memorial Museum, which documents the atomic bombing of August 6, 1945 and its aftermath. The museum is located in Peace Memorial Park, a well-designed green space that has multiple commemorations throughout. These include an eternal Peace Flame, and an arch-shaped cenotaph etched with the names of all of the people killed by the bomb. 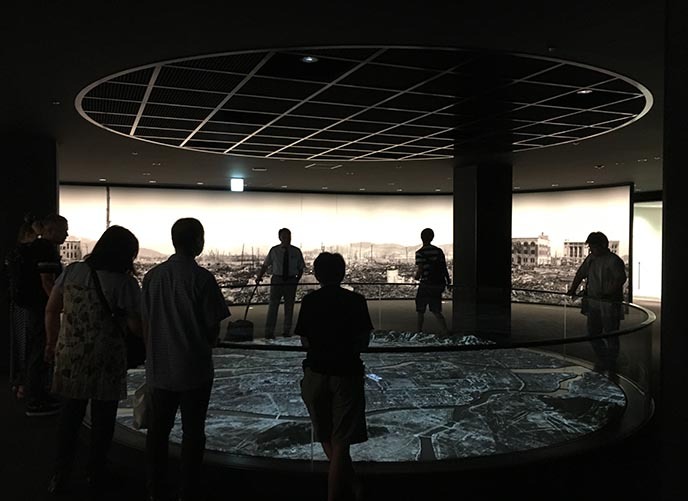 The Hiroshima Peace Memorial Museum uses interactive technology to powerfully convey the scale of the nuclear destruction. This circular video shows a bird’s eye view of the city, and follows the bomb as it hits the hypocenter. As many as 140,000 people died from the US atomic attack, both from the direct impact and the later radiation sickness. This black and white panorama shows how the bomb’s blazing heat and radiation laid total waste to Hiroshima. Other displays talk about the history of Hiroshima both before and after WWII, including the health effects, politics, rebuilding, and other topics. 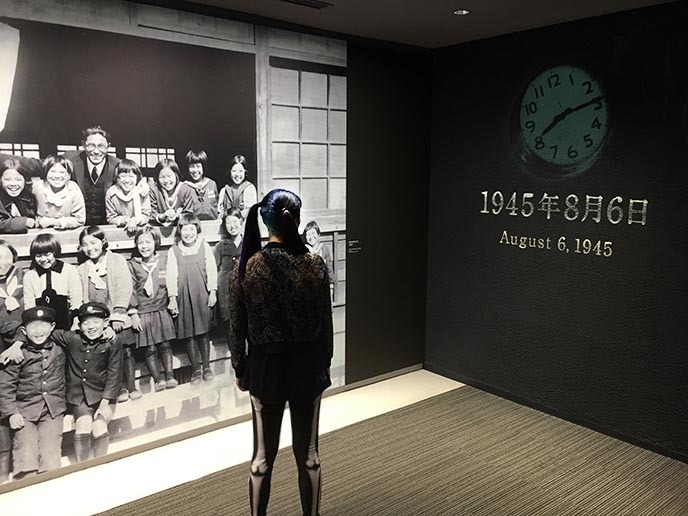 I thought the most powerful exhibits were the stories of survivors, especially children who described the pain and horror around them, and the loss of their family members. 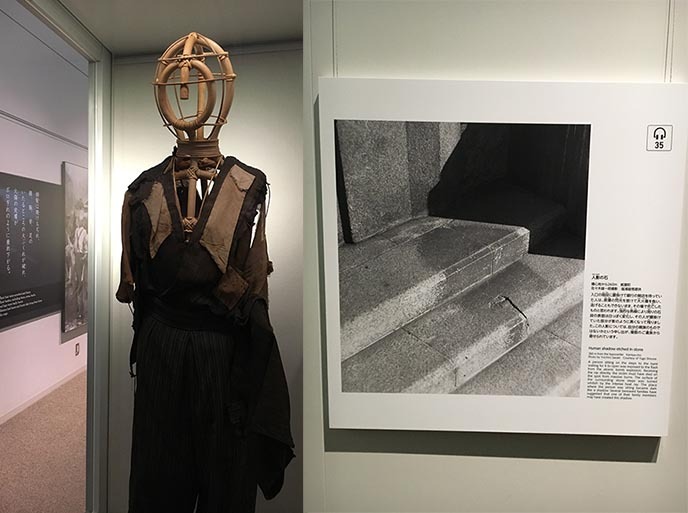 Above are some of the most haunting images: the tattered clothing of the dead, and the shadows left behind by those vaporized in the thermal radiation. 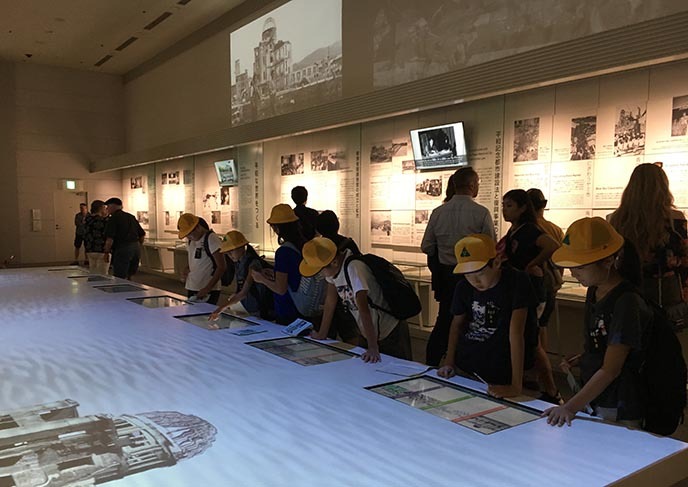 I saw dozens of Japanese school kids in matching hats at the museum; it was good to see children learning first-hand about the bombing of Hiroshima. These exhibits highlighted recent developments such as Obama’s visit, and ongoing worldwide efforts to make sure this never happens again. 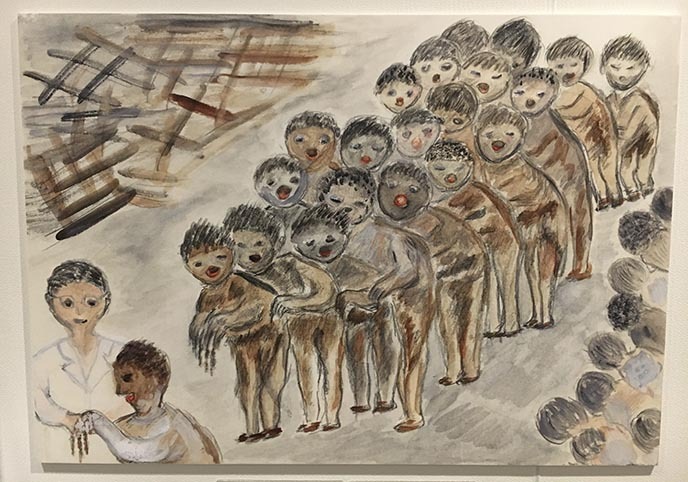 One of the most powerful exhibits consisted of artwork by survivors. I felt that their memories, depicted through art, conveyed the terror even more vividly than the photographs. 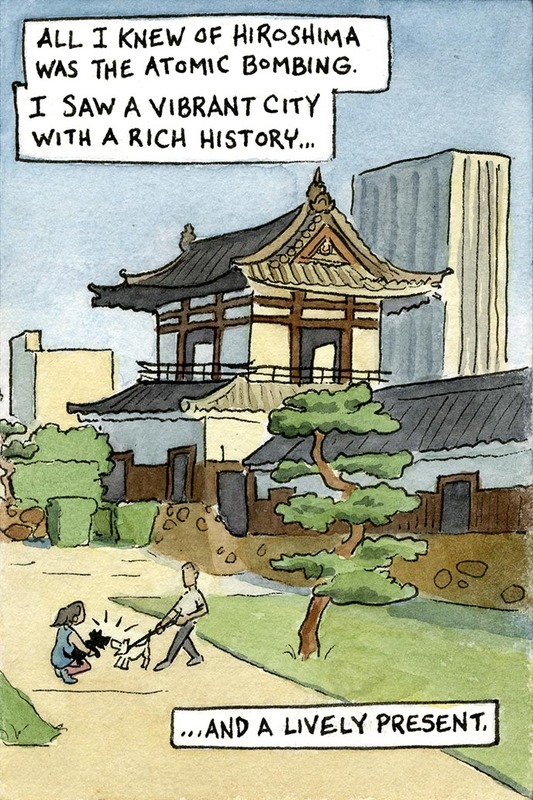 I hope you enjoyed the new travel art feature, and our stories of the historical / cultural attractions! 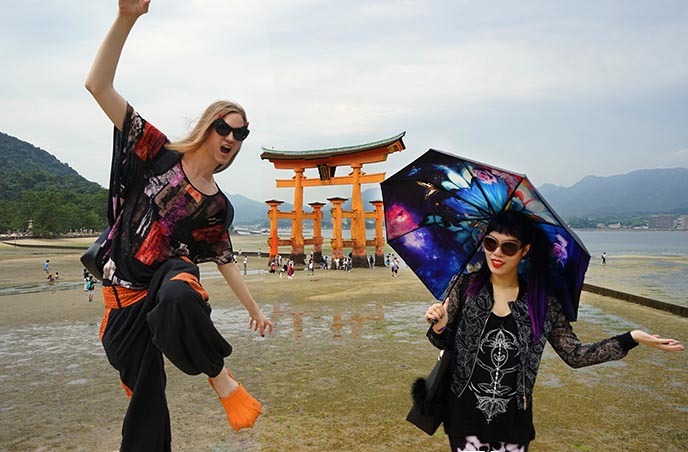 In an upcoming post, we’ll focus on the fun alternative fashion and pop culture of Hiroshima — after all, this is the hometown of Mana of Malice Mizer. If you’re in Tokyo and interested in visiting Hiroshima, I highly suggest booking a JAPANiCAN travel package. 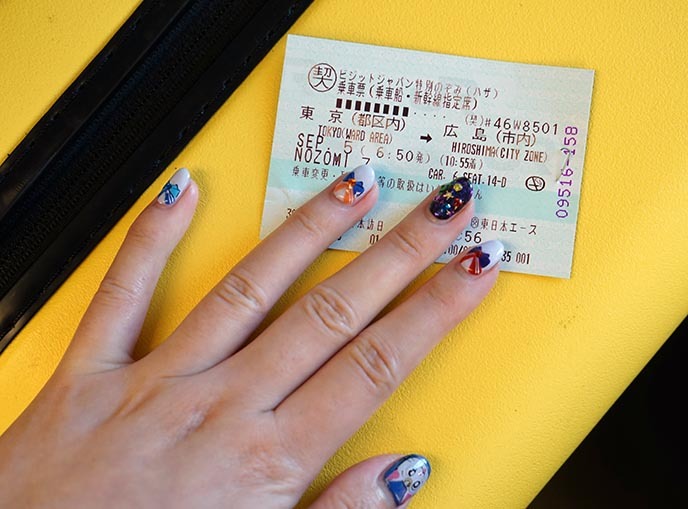 Our three-day train and hotel deal saved us the headache of making arrangements, and the total price was less than if we had booked independently. 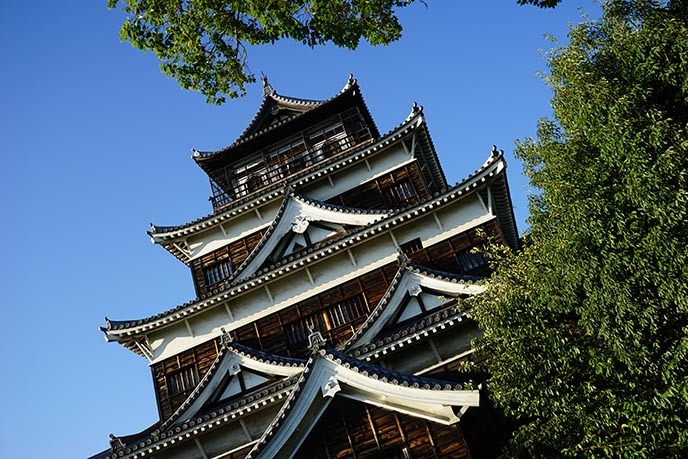 You can find out more, and see packages and tours for various Japanese cities, on their site. Finally, are you getting excited for Halloween yet? A lot of spooky fashion has just been released for the season of the witch! 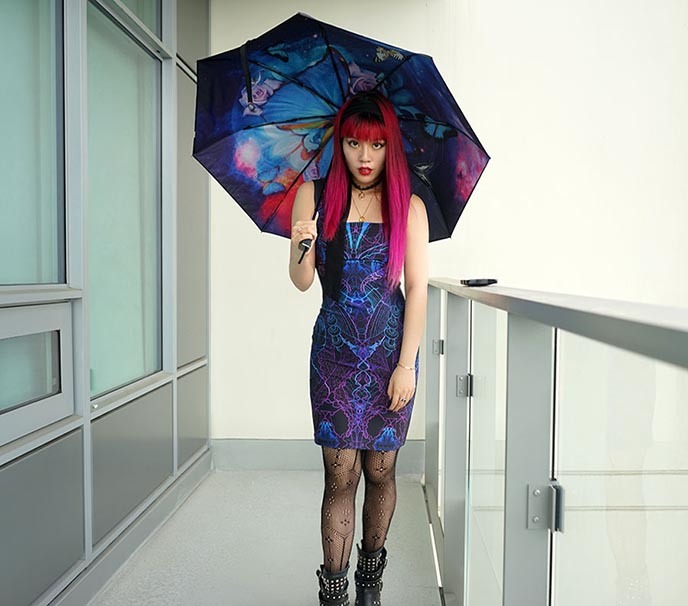 I found the above Halloween Gothic clothing collections here and here — happy shopping! 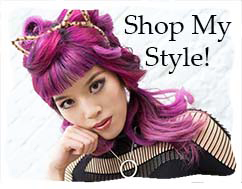 For the latest Goth Halloween fashion, visit this site.